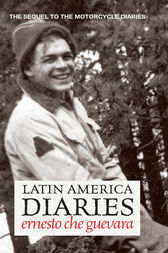 This sequel to The Motorcycle Diaries includes letters, poetry, and journalism that document Ernesto Che Guevara's second Latin American journey following his graduation from medical school. After traveling through Bolivia, Peru, Ecuador, and Central America, Ernesto witnesses the 1954 US-inspired coup in Guatemala. He flees to Mexico where he encounters Fidel Castro, marking the beginning of a political partnership that profoundly changes the world and Che himself. This new, expanded edition has been fully revised especially for Ocean Press by Che's widow Aleida March, meticulously correcting her own work of checking Che's handwriting. Includes thirty-two pages of unpublished photos, including photos taken by Che's son Ernesto as he retraces his father's footsteps. Features a prologue by Alberto Granado, Che's traveling companion in The Motorcycle Diaries. One of Time magazine’s icons of the century,” Ernesto Che Guevara was born in Argentina in 1928. After graduating from medical school, he traveled throughout Latin America. After meeting Fidel Castro in Mexico, he joined the revolutionary forces that overthrew the Batista dictatorship in Cuba in 1959. He became a central leader of the Cuban revolutionary government and later led guerrilla missions to Africa and Bolivia, where he was assassinated in 1967on the orders of the CIA. His life has been dramatized in two recent popular movies: The Motorcycle Diaries” (directed by Walter Salles, starring Gael García Bernal) and Steven Soderbergh’s epic Che” (starring Benicio Del Toro). Ernesto Guevara is the younger son of Ernesto Che Guevara and Aleida March. He lives in Havana and works as a lawyer.